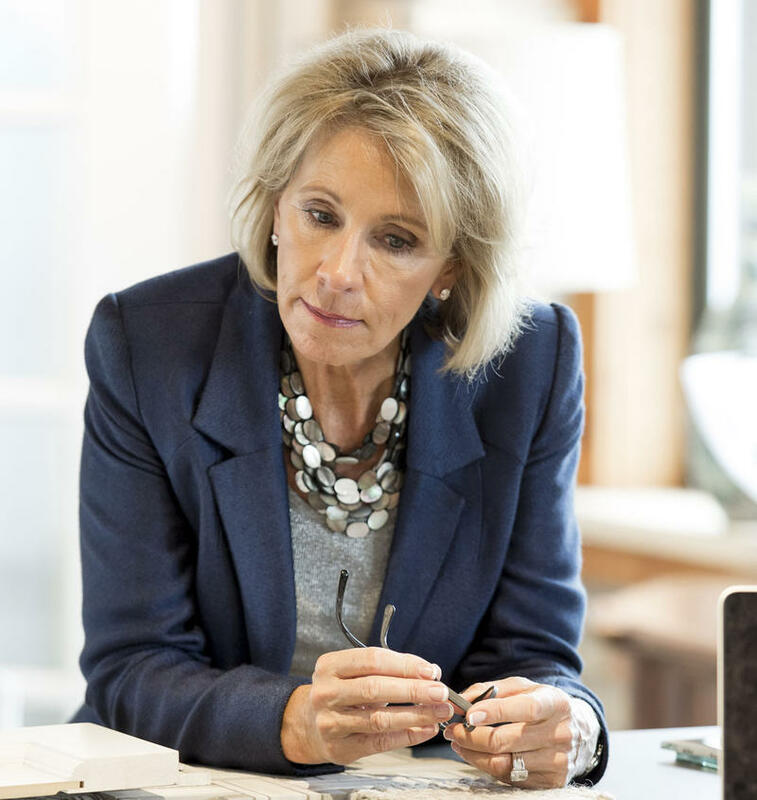 Betsy Devos was confirmed as U.S. Education Secretary on Feb. 7, 2017. Imani Harris is a junior at Renaissance High School, the top tier traditional public school in the city. She was doing an experiment in her chemistry class yesterday afternoon when her cell phone buzzed. Her mom texted her to say "sorry...Betsy DeVos has been confirmed." Imani is not a fan of Betsy DeVos and her push for school choice and charters. "My first thought was, 'Oh my gosh, the United States of America is going to look like Detroit,' and I know that’s a sad thought, but education in my city does not look the best right now." More students in Detroit go to charter schools than traditional public schools. And only a handful of charters significantly outperform the traditional public schools in the city. Imani and her mom, along with countless others across Michigan, spent the past several months protesting DeVos’s nomination for U.S. Secretary of Education and we now know they lost that fight. "We continue to fight," says Wytrice Harris, Imani's mom. Harris is with the education advocacy group, 482 Forward. The group's main focus right now is to stop the state from closing 38 failing schools, 25 of which are in Detroit. "Closing a school does not improve the education of children in anyway and it actually causes a lot instability in the neighborhoods and communities." "Closing a school does not improve the education of children in anyway and it actually causes a lot instability in the neighborhoods and communities," says Harris. "So instead of closing the school we need to go look at what’s happening in that school and concentrate on how we can make that school better." Of the 25 schools, one is a charter, the other 24 are traditional public schools; all are legally required to close thanks to a 2016 state law. The law was crafted with help from a pro-charter group called The Great Lakes Education Project. Betsy DeVos co-founded GLEP, and she was on the board when the group lobbied for the law. Gary Naeyaert is the group’s executive director. He was frustrated that the state wasn’t doing enough about low-performing schools. He says the legislation fixed that so "schools that were chronically failing to educate kids would have to be replaced or closed." Naeyaert says DeVos was effective in Lansing, and she’ll be effective in DC too. "... parents and people who care about choice and quality are going to have a good friend in Washington." "It’s always helpful to have friends in high places," he says, "and I think that it’s safe to say that kids and parents and people who care about choice and quality are going to have a good friend in Washington." He says DeVos isn’t the first pro-charter education secretary. But her commitment to choice goes beyond charters -- to include the controversial use of vouchers: public money for private schools. "We haven’t had a vigorous national debate about full and comprehensive choice that would allow at-risk kids, or any kids really, to go to private schools using public funds, but I think that’s a debate that we’re likely to have now," says Naeyaert. Fourteen states plus Washington D.C. already have traditional voucher systems, and even more states offer other forms of private school choice. Betsy DeVos tried in 2000 to get a ballot initiative to bring vouchers here to Michigan, but that effort failed. Her appointment as education secretary could bring her another chance to make that happen.